Synthetic peptide corresponding to residues in Human RAD18 (UniProt Q9NS91). 293T, HCT-116, K562 and HeLa cell lysates; Permeabilized K562 cells. Our Abpromise guarantee covers the use of ab157463 in the following tested applications. WB 1/10000 - 1/50000. Predicted molecular weight: 56 kDa. 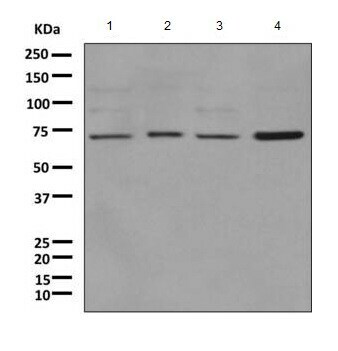 E3 ubiquitin-protein ligase involved in postreplication repair of UV-damaged DNA. Postreplication repair functions in gap-filling of a daughter strand on replication of damaged DNA. Associates to the E2 ubiquitin conjugating enzyme UBE2B to form the UBE2B-RAD18 ubiquitin ligase complex involved in mono-ubiquitination of DNA-associated PCNA on 'Lys-164'. Has ssDNA binding activity. Belongs to the RAD18 family. Contains 1 UBZ-type zinc finger. 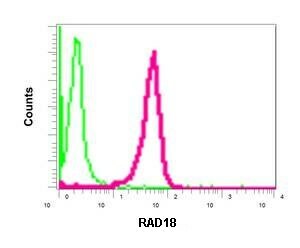 Flow cytometric analysis of permeabilized K562 cells labeling RAD18 with ab157463 at 1/10 dilution (red) compared to a rabbit IgG negative control antibody (green). ab157463 has not yet been referenced specifically in any publications. Publishing research using ab157463? Please let us know so that we can cite the reference in this datasheet.